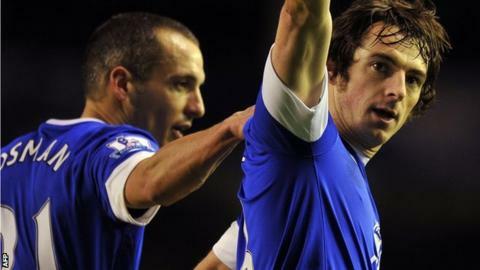 Leighton Baines scored two first-half goals as Everton boosted their top-four hopes with a narrow win over West Brom. Baines opened the scoring with a fine strike from the edge of the box before converting a penalty after Claudio Yacob's foul on Victor Anichebe. The deficit was halved when Shane Long headed in after John Heitinga's poor clearance from Romelu Lukaku's shot. Graham Dorrans and Steven Pienaar both hit the woodwork in a tense finale as chances went amiss at both ends. The result moved Everton within a point of fourth-placed Tottenham, while West Brom's worrying dip in form continued and they have now claimed just one point from their last five Premier League matches. "This should have been more comfortable for Everton, put in command by a brace from the brilliant Leighton Baines. West Brom at least showed a bit more fight in the second half, yet despite Shane Long halving the deficit, you never really felt they were going to come back into this." David Moyes, who pulled out of an £8.6m deal for Leroy Fer earlier in the day, left Nikica Jelavic out of his starting line-up, with Heitinga restored. Jerome Thomas came into the Baggies side for Peter Odemwingie who, as expected, was absent from the squad on compassionate leave after his new-born son was taken ill. The future of the forward, who has been the subject of two failed bids from Queens Park Rangers, will now be resolved on Thursday's deadline-day. Everton came inches away from an opener in the 19th minute when an Anichebe knockdown found Marouane Fellaini, whose effort from the right side of the penalty box cannoned off the outside of the right upright. However, Moyes's side had just another 10 minutes to wait for their opener as Baines finished the move he started, eventually racing onto Leon Osman's measured pass down the left channel before unleashing an unstoppable swerving strike inside the top-left corner. The Baggies suffered a further setback when George Thorne collapsed to the ground holding his knee after jostling for possession with Osman and the midfielder was carried from the field on a stretcher. Yacob was introduced in Thorne's place but the Argentinian's first meaningful contribution was to give away a penalty for a barge on Anichebe. Baines stepped up and sent Ben Foster the wrong way with a low shot into the bottom-right hand corner for his sixth goal of the season. West Brom improved after the interval and Lukaku served an early warning when he fired over from Thomas's pass within seconds of the restart. But Steve Clarke's team were celebrating midway through the second half when Lukaku rounded Tim Howard and fired goalwards. Heitinga's attempts to control the ball on the line ended disastrously as the ball spun up invitingly for substitute Long, who headed in from close range. The Baggies almost drew level in the 67th minute when Dorrans curled a stunning free-kick against the right-angle of the crossbar after Phil Neville had fouled Yacob. Yet they had a fortunate escape of their own late on when Osman somehow blazed over the crossbar from point-blank range with the goal gaping after Pienaar's shot against the left post had fallen into his path. Everton manager David Moyes: "I thought it should have been more straightforward. We gave away a really shabby goal. We had a great chance to make it three (via Osman). "Leighton is a special player and he continues to add something to our team. I see him getting better in lots of ways, his football intelligence and how he can improve his and the team's performances." West Brom head coach Steve Clarke: "It's disappointing. It's not been a good start to the year for us. We gave ourselves too much to do and we have been doing that too much recently. "Of course it's a worry if you give two goals away, it's very unusual you come back. "Maybe with a bit more composure we could have got something out of it. Graham Dorrans was unlucky with the free-kick against the crossbar. We need to dig in. The harder you work, the luckier you get."